My grandparents had a root cellar and as a child it was one of my favorite places. Nanny would take me down there and we would emerge with onions and potatoes. She'd then fry them up and serve them to Papa for lunch, along with greens and cornbread. I loved being in the root cellar and to this day fried taters and onions bring back fond childhood memories. I never realized what a blessing the root cellar was, but as an adult I do. As food prices climb, being able to store your own homegrown vegetables long term would be a huge help. I've always wanted one, but assumed you had to have a cellar or basement to make this happen. 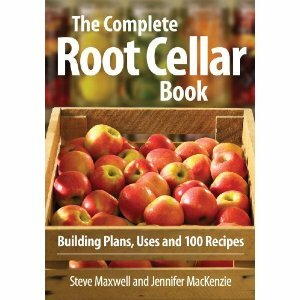 Then I read The Complete Root Cellar Book: Building Plans, Uses, and 100 Recipes by Steve Maxwell and Jennifer MacKenzie. This book has detailed plans that can help you build your own root cellar whether you have basement space or live in a condo. With this book and a little hard work one can easily have a root cellar of their own. The plans are easy to understand even for someone who doesn't do many DIY projects. Hubby and I are super excited about putting together a root cellar of our own! Before long will we be preserving our own food and hopefully saving on our food costs. This book also shares some wonderful recipes. If you've ever struggled with what to do with some of the produce you have stored, then you might want to check it out. Who doesn't love trying new recipes, right? I was really impressed with all the information presented within the book's pages. What about you? Do you have a root cellar? Do you feel it helps you cut down on food expenses? I received a complimentary copy of this book to facilitate the review. All opinions expressed are 100% my own. cut the lock and you have one in your backyard.....of course you will have to go down and clean it out. Make a small garden with a tall fence. While deer can certainly jump, they do need a bit of space to do so. They won't likely have the percision to jump your fence and land in a smallish area. You can fit quite a bit of produce even in a small garden. No, we don't have a root cellar. I remember my Dad dug our basement when I was growing up. He had the help of his brother who was out of work at the time. They dug it out by hand and cinder blocked and cemented it in and poured the concrete floor themselves. It should have probably been dug a little deeper. There was one hanging pipe you had to duck under a little to get past in one part of that basement. My Dad wired it himself. There was no plumbin in it. He did make my brother his own bedroom. My Dad had a workshop area. There was one large room to store things in and for us kids to play in. Overall it served it's purpose. Under the stairway was where my mom keep the 50 gallon can of flour (truly 50 gallons), she made her own bread, etc., she keep onions and potato's there too. Sometimes apples where there, but mostly she canned the fruit and some vegetables. They then were stored in the large room on some shelves. My grandmother had a cellar she and my grandpa dug in her backyard. They didn't have a basement. I didn't like going into it. It always felt damp and musty, but it too served it's purpose. I wish we had a basement in our home, but we don't. It wouldn't even have to be a livable space, just a storage space and a place to go in case of a tornado. I think more and more people are canning and storing foods, so this is very good information in this post. I don't have a root cellar, but I feel your pain about food prices! I remember us talking about this recently - in this economy, it's so much easier and cheaper to buy the food that's NOT good for you than it is to buy fresh produce anywhere. I'm making plans to start my own garden, luckily deer are not a problem where I like, but now I'm giving serious thought to a root cellar. I'm going to do a bit more research and I'll let you know how it goes!